The route today is about 40 miles which should have some good path through Lancaster but the rest will probably not be pleasant. 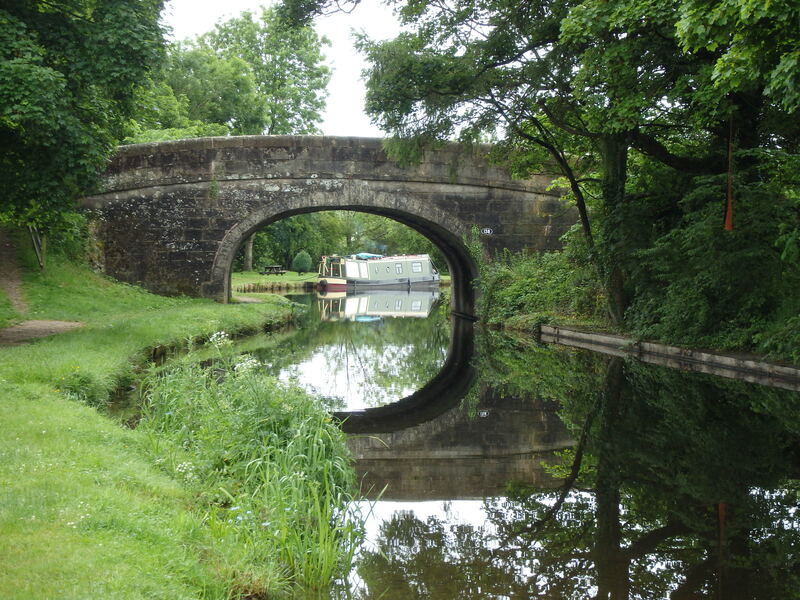 Not many navigational decisions today its straight along the Lancaster canal to its end. We were up even earlier than normal; I had booked train tickets back at 16:30 on Sunday from Oxenholm to London so we had to be there by then. An added complication was that we were not certain we could put or bikes on the train so we arranged to leave them in in Nigel’s garage, we would collect them later. A good reason to visit the north again and maybe have a beer or two. Leaving the hotel it was clear it was not going to be a great day it was very overcast but surprisingly warm. 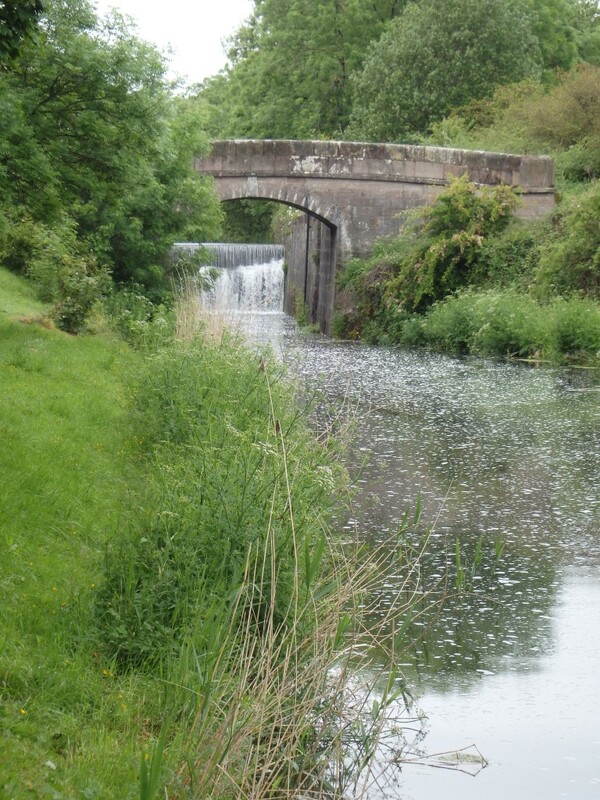 The start was an easy mile along the road back to the canal. We only had a slight delay as I missed the turning! 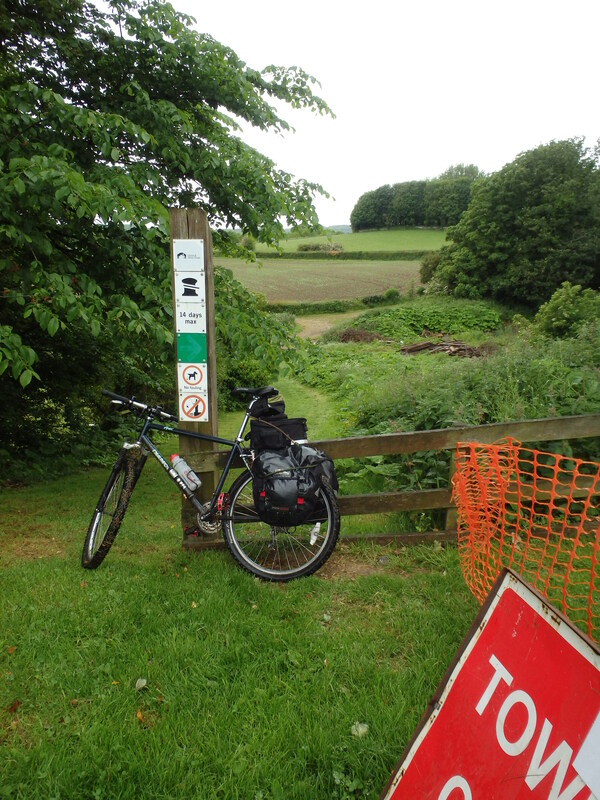 A quick “U” turn and we were soon lifting our bikes over the wall and down onto the tow path. The path was not great but still rideable, we were almost there NOTHING would have stopped me on this last day and I was sure that whatever came our way Susan would be there at the finish… you don’t give up on something this hard so close to the end without a very good reason, 360 old miles down 40 to go. As I said it was warm so we pulled up under a tree to remove our jackets when sods law struck. As we came out from under the tree it started to really pour down, freezing cold lashing rain. 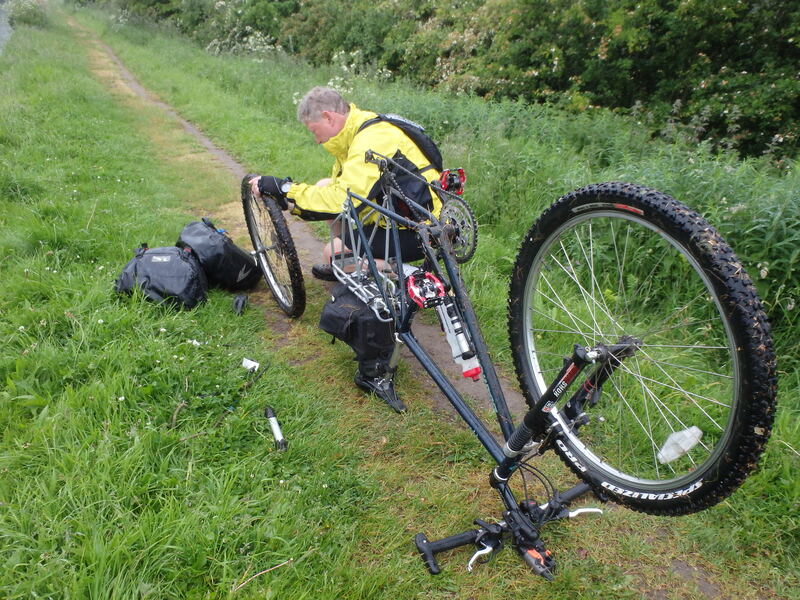 Jacket replaced we remounted and set off again when I got yet another puncture. This was very unpleasant with water pouring down my neck, fingers freezing etc but we had it done in a reasonable time. A couple walking past in “Dri as a bone” type long coats with dogs suggested it was not the best time to get a puncture… what is it in ourselves that stops us pushing these smart arses into the water for stating the blooming obvious and anyway why are they out walking at 6 am? The path looked ok it was new gravel but this actually was quite deep, loose and hard to ride through but we would soon be in Lancaster. At times we got off and pushed especially though very rutted tree rooted sections. It was still raining when we got to Lancaster so I decided I would use my waterways key and avail myself of their facilities. Susan waited outside but I suggested that it was so bloody wet we should both shelter for a while. 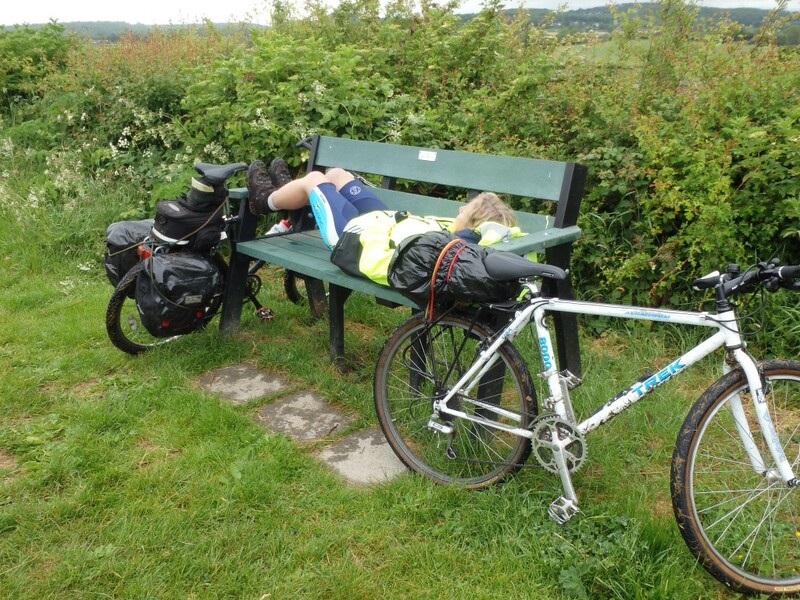 We pushed our bikes into the “rest area” and took a weight off my “mind”. It was lovely and warm so with some reluctance we had to get back outside… there was a train that we had to catch. Sheltering in the door way of the waterways loo in Lancaster. Just outside Lancaster we crossed the very impressive River Lune aqueduct, built in 1797! 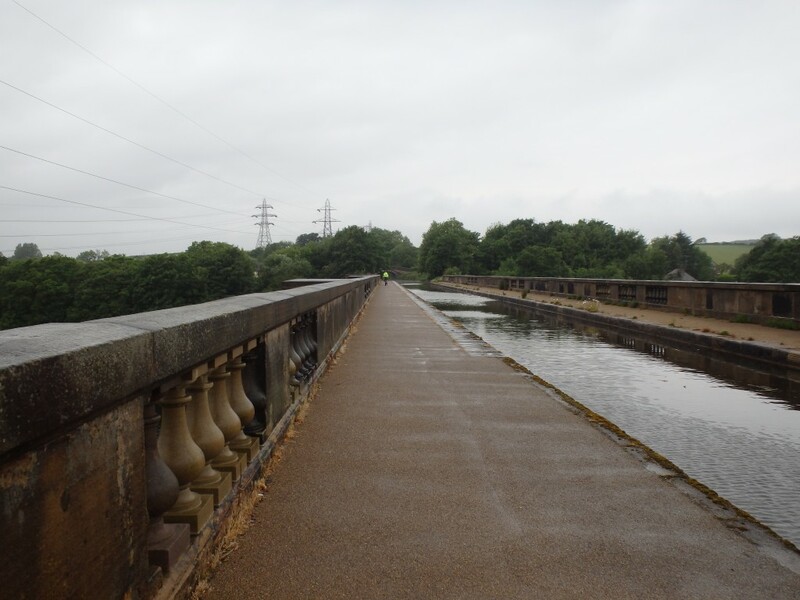 There was quite a bit of switching sides of the tow path here so we carefully evaluated every bridge crossing but I had actually got it all planned properly. I was too slow taking this picture. 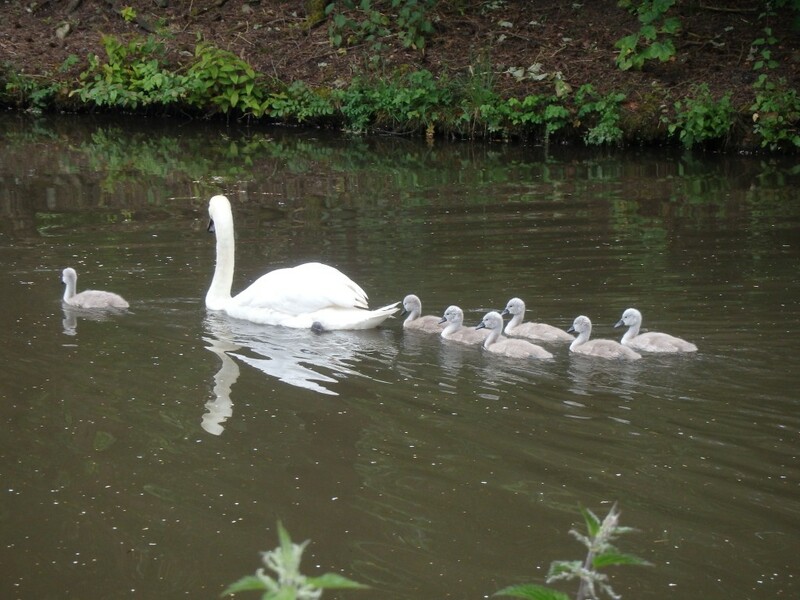 When I first stopped the signets were in a perfect line behind the adult swan. By now it was about 9 am we were freezing wet and quite down so we resorted to getting some tea in the BP garage to get some heat back into our fingers. It was just what we needed as the stop had allowed the weather to brighten a little so with some optimism we continued, I had some optimism I really cannot tell you how Susan seemed to be feeling, there was an air of gloom about her today. Her mood was not lightened by yet another tow path closed sign, the detour looked quite rough and looked to go quite a way from the canal side across fields and through woods. 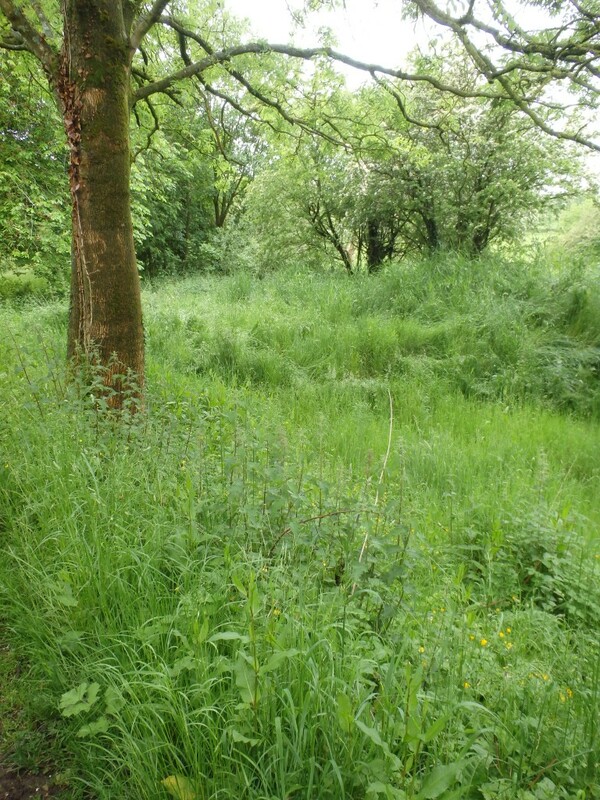 I didn’t fancy it so went round for a recce… all was fine with the path was closed because there was a hole about 2 feet square dug out of it. We went through the fence and continued on our way. 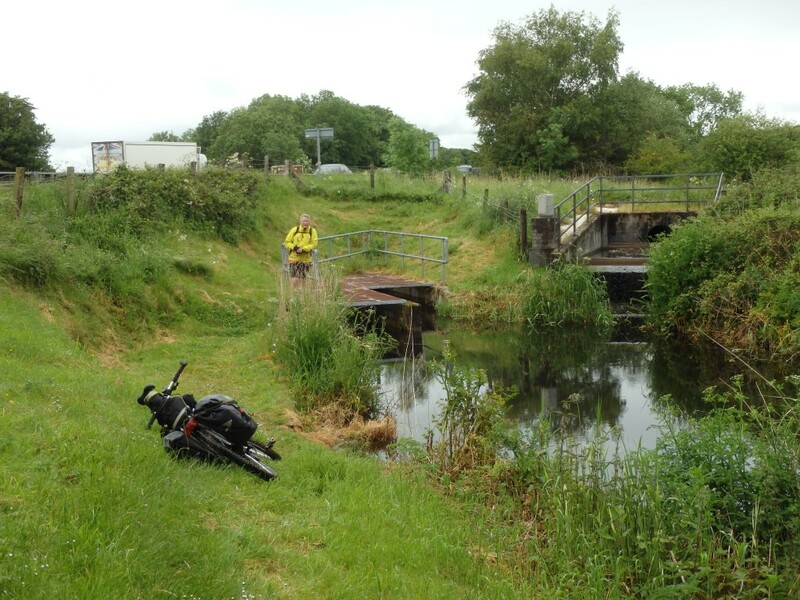 Another tow path closed with diversion indicated…. 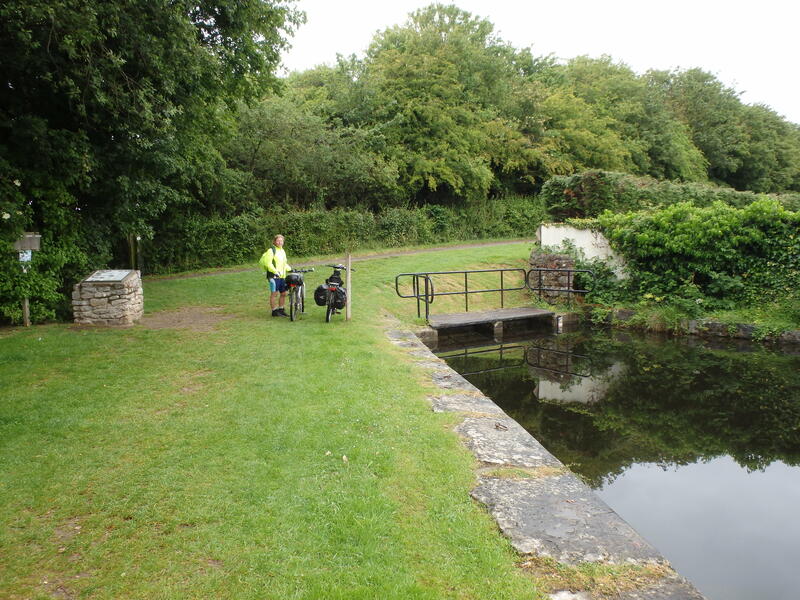 We did eventually get to the “first” end of the Lancaster canal at Tewitfield Tunnel.. Yes it just stops like it just started in Preston. 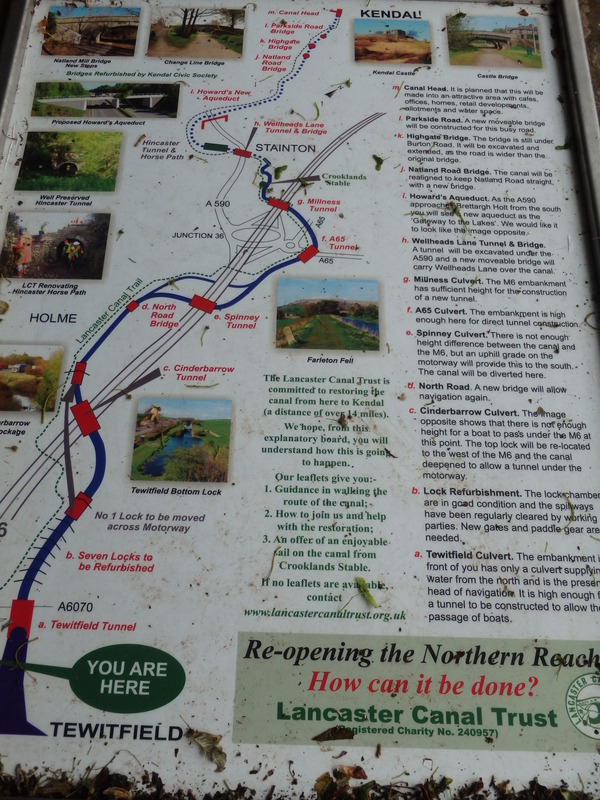 There is a public information sign here explaining the plans to reopen the northern reaches from here to Stainton. 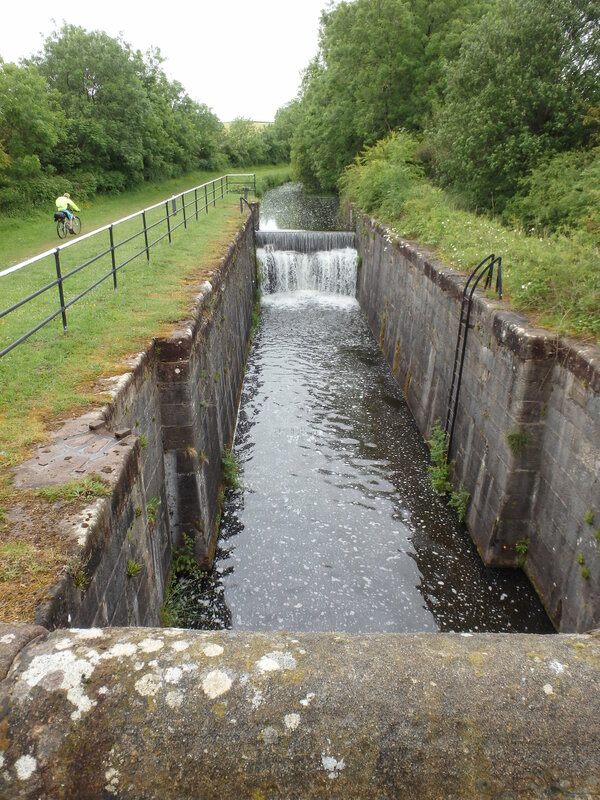 We turned left and cycled along the side of the M6 rejoining the canal soon after the road bridge past the 8 derelict locks and some old lock gates, we then we came to another abrupt end. 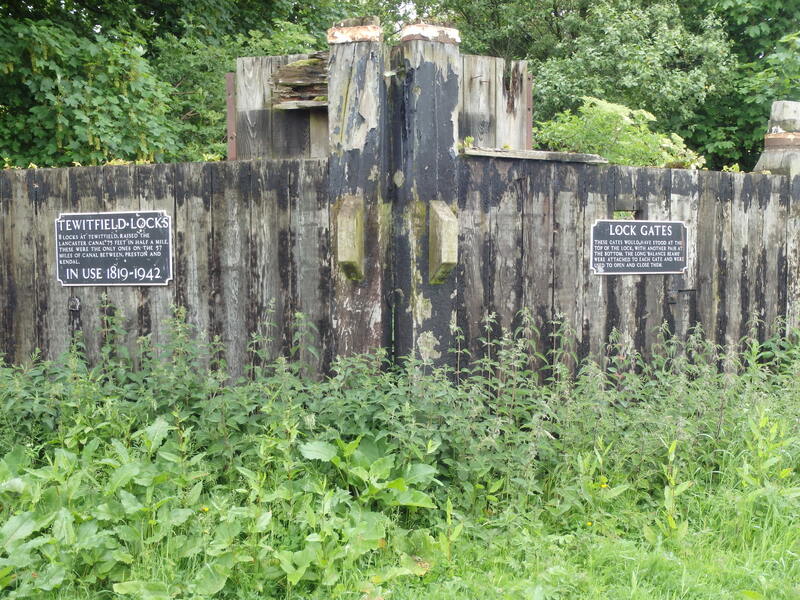 The first Lock for restoration? Eventually we ran out of water and we had done the top dry section before, we had no inclination to do it again. By now we were a little behind schedule and we had to catch that train and I wanted a beer…. so we did go by road for the last 5 miles. As I said this was not cheating as we were actually following the route I had planned in the SatNav. Although it was hillier the road was much easier and we were soon parking our bikes in Nigels garage. We now had a critical decision to make, Shower, clean clothes or directly to the pub? 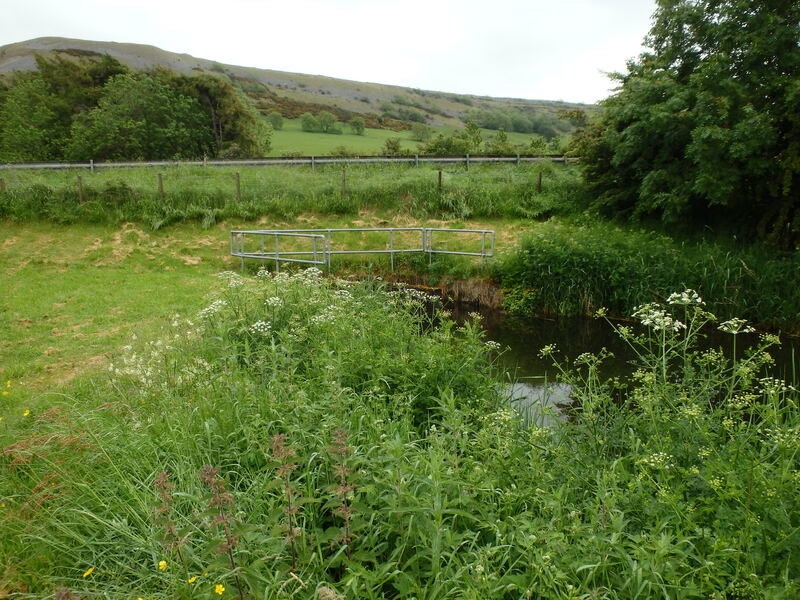 Here is a little clue as to what we decided…. 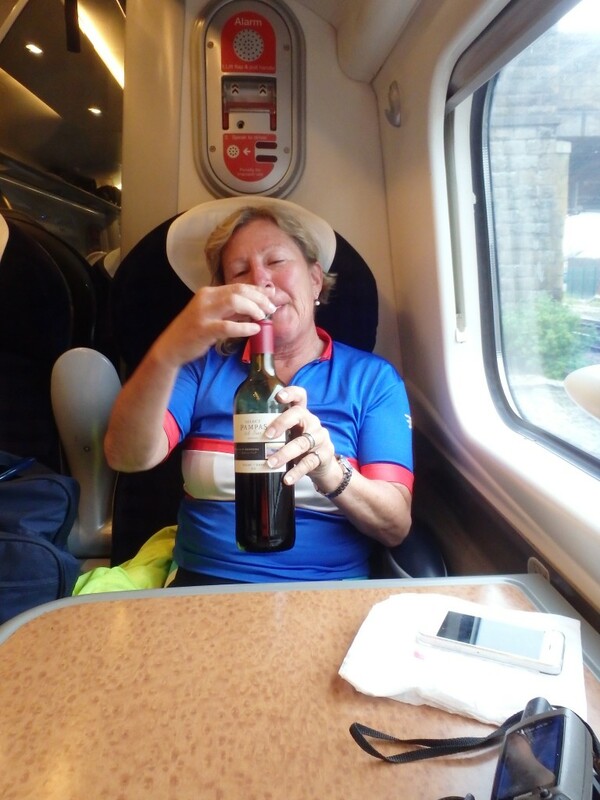 Susan sat on the train still in my old Farnham racing top… how did I ever fit into that? Looks like a nice ride. 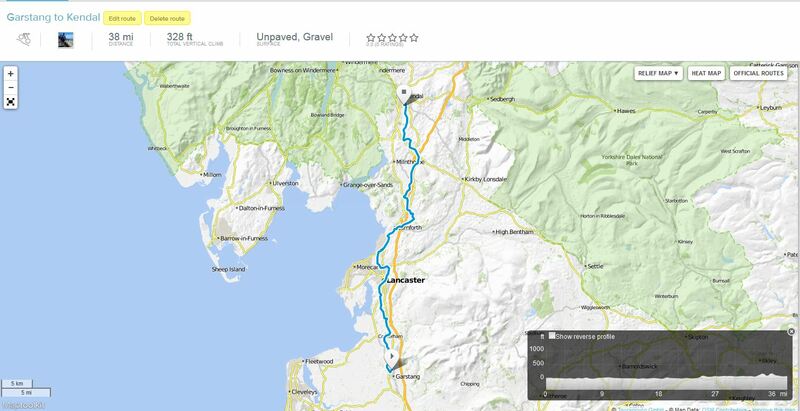 Cumbria is one area of England I have not ridden yet, so I might consider it when I am over there next year. My paternal ancestors cam from that region.